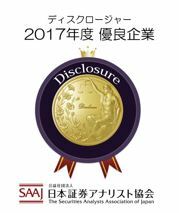 Tokyo, October 12, 2017 – Subaru Corporation has been selected as the top company in the “automobile, auto parts and tires” category of the 2017 Awards for Excellence in Corporate Disclosure presented by the Securities Analysts Association of Japan (SAAJ). This is the fourth consecutive year that Subaru has received this award. Subaru received high marks topping in four of the five criteria among the 19 companies in the “automobile, auto parts and tires” category that were evaluated. As its management philosophy, Subaru aims to be “a compelling company with a strong market presence” based on the customer-first principle. We will continue to meet our responsibilities as a company that conducts its business on the global stage and, in our IR activities, will seek to further enhance shareholder and investor understanding of Subaru through the broad-based and fair disclosure of corporate information.